Running Time: 1 hr. 37 min. It takes more than Kensington Gore to make a good monster movie, and it takes more than spackling your film with Shakespearean tropes to lend it Meaning™. 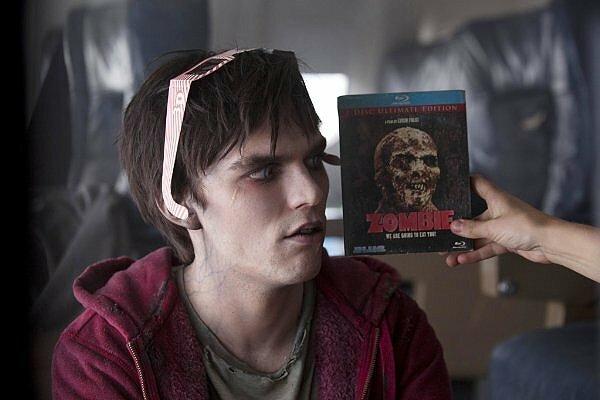 Warm Bodies tries to have to both ways, along with harvesting the teen romantic-comedy market for good measure. Isaac Marion’s source novel of the same name was published in late 2011, an important fact in nailing down its sundry pop-cultural influences. It’s Romeo & Juliet meets The Walking Dead meets Twilight meets a steaming pile of rotting entrails. Our narrator is a zombie named R (Nicholas Hoult)—as in Romeo, get it?—who falls for a girl named Julie (Teresa Palmer)—as in Juliet, get it?—and has a best friend named M (Rob Corddry)—as in...oh, forget it. There’s also a scene where R appears below Julie’s balcony. But while R and Julie’s respective tribes don’t get along, it has less to do with family squabbling and more to do with the fact that R’s undead pals want to feast on Julie and the last vestiges of humankind. But R is unusual, starting with the fact that while he can’t talk, sleep, dream or do anything but amble around all day waiting for a dollop of viscera to fall his way, he can provide an entirely articulate, introspective voice over narration. While on food patrol one day, R and his buddies happen upon a band of gun totting 20-somethings, including Julie and her boyfriend Perry (Dave Franco). R munches on Perry’s brains, allowing R to absorb and envision Perry’s memories, which are projected somewhat miraculously in two-shot and multi-angle imagery. R becomes infatuated with Julie and sneaks her to his home, an abandoned 747 parked on the tarmac of a derelict airport. Never mind the fact that R chowed down on Julie's boo—his tousled hair and ‘80s vinyl record collection, when combined with a heady dose of Stockholm Syndrome, is all that’s required for her to go gaga. In return, R starts experiencing some special feelings that spread to the rest of his carnivorous clan the first time they glimpse R and Julie holding hands. Director Jonathan Levine (50/50, The Wackness) aims to imbue this romance with some sidelong commentary about our disconnected society. But limiting ourselves to the zombie genre, that was done better and more satirically in just the opening half-hour of Shaun of the Dead. All Warm Bodies does is offer up such puzzling queries as why these zombies are the slow-moving George Romero kind at the beginning of the film but the frenzied 28 Days Later variety by the end. Why is ‘80s rock, record players and Polaroid instant cameras featured prominently alongside iPods, Blu-ray and convertible BMWs? What is the power source for R’s airplane and the moving walkways at the zombie-populated airport? Since R is already dead, why does Julie constantly refer to the threat of him “dying” or getting “killed,” including at the hands of her ramrod, freedom-fighting father (John Malkovich)? Levine shoots the film in a drab grayscale; apologists would say this is to capture the look of a post-apocalyptic tableau when its true intent is avoiding the sort of vivid imagery that would usually carry with it an R-rating instead of the tepid PG-13 the filmmakers clearly wanted. Moreover, if you’re going to foist Romeo & Juliet, then have the courage of your literary conceit and embrace its tragic story arc. Put these together, and Warm Bodies is the thing you’d least expect: bloodless.